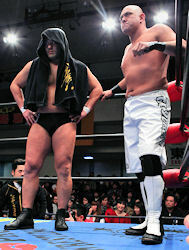 Event: All Japan "New Year Shining Series 2010"
This match is for Kea and Suzuki's All Japan World Tag Team Championship. Funaki and Suzuki start things off. Kicks to the leg by Suzuki but Funaki backs out of it. They circle each other, takedown by Suzuki, Funaki goes for the arm but Suzuki gets out of it. They jockey for position, Funaki goes for the triangle choke but Suzuki returns to his feet. Funaki tags in Mutoh while Funaki tags in Kea, takedown by Kea but Kea allows Mutoh to return to his feet. Waistlock by Mutoh and he covers Kea, but Kea switches positions with him. Armdrag by Mutoh but Kea applies an armbar until Mutoh gets a foot on the ropes. Mutoh rolls out of the ring to re-group but returns after a moment, tie-up, side headlock by Kea but Mutoh Irish whips out of it. Shoulderblock by Kea, he goes off the ropes but Mutoh catches him with an armdrag. Kea tags in Suzuki, takedown by Mutoh and he applies a wristlock before tagging in Funaki. Suzuki kicks Funaki as he enters the ring and the two trade slaps and kicks. Suzuki pushes Funaki to the mat and kicks him in the chest, but Funaki slaps on a cross armbreaker as Suzuki quickly gets to the ropes to force a break. Kicks to the arm by Funaki and he tags Mutoh back in, snapmare by Mutoh and he delivers the Flash Elbow. Keylock by Mutoh, he picks up Suzuki and pushes Suzuki to the mat while applying pressure to his arm. Mutoh tags in Funaki, kicks to the chest by Funaki, he goes off the ropes but Suzuki catches him with a knee to the stomach and throws Funaki out of the ring. Kea jumps outside and throws Funaki into the railing, kneeing him in the midsection. Kea slams Funaki into the apron before sliding him back into the ring, Suzuki picks up Funaki, snapmare, and he kicks Funaki in the back. Cover, but it gets a two count. Suzuki picks up Funaki, knees by Suzuki and he goes off the ropes, with Kea doing a blind tag. Lariat by Kea, cover, but it gets a two count. Suzuki tosses around Mutoh outside the ring while in the ring Kea hits Funaki with a jumping elbow strike followed by a reverse splash for a two count. Kea applies a reverse chinlock, he picks up Funaki and tags in Suzuki. Knee to the ribs by Suzuki, judo throw by Suzuki and he applies a side headlock while trapping Funaki's arm. Funaki wiggles out of it and then grabs the bottom rope for a break. Suzuki applies a single leg crab hold and he tags in Kea. Kicks to the arm by Kea, he picks up Funaki and punches Mutoh off the apron. Back to Funaki, chops by Kea and he delivers a vertical suplex. Cover, but it gets a two count. Reverse chinlock by Kea and he rakes Funaki in the eyes. Kea tags in Suzuki, who applies a leg lock to Suzuki through the ropes while the referee is busy elsewhere. Finally the referee breaks it up, Kea picks up Funaki and throws him out of the ring to Suzuki.